Jeff and I were lucky enough to meet right before we graduated from Villanova University outside of Philadelphia, PA. We began dating shortly after meeting and were inseparable ever since. 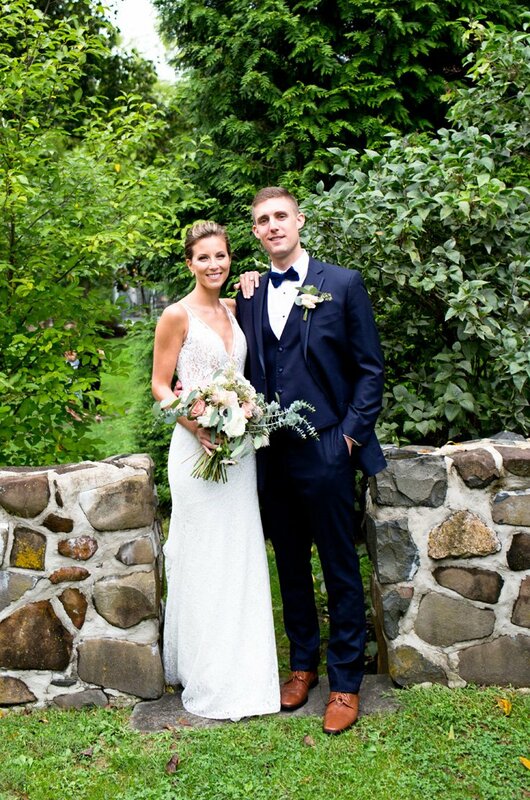 We both come from big Villanova families and knew we wanted to be married at the chapel on campus. 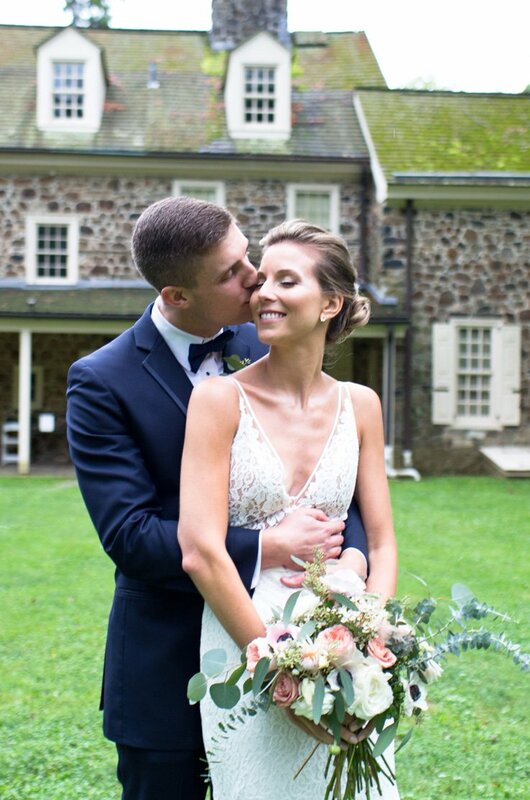 We picked the Anthony Wayne House in Paoli, PA for our reception venue – a beautiful outdoor tented garden space. We wanted to compliment the elegance of the chapel at Villanova where our ceremony would be held but wanted our reception to be casual and most of all fun! I was so nervous to go wedding dress shopping! For me, the dress really sets the tone for the whole day and it was so hard to pick just one dress for such a big event. 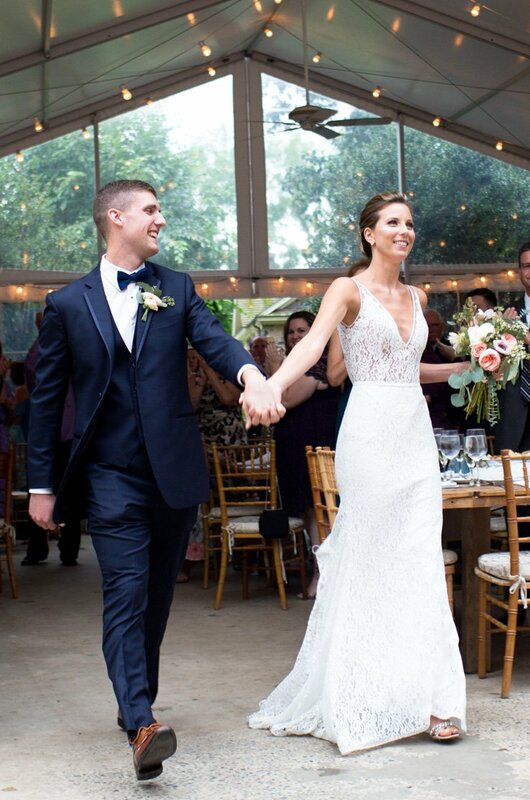 I was really in love with the look of a sleeved dress, but our wedding was in early September and I was worried that I would be too warm if we got a humid day. I also tried on a few long sleeved dresses and never felt comfortable moving around. Being able to move freely for dancing was very important to me! I went to a few different places around Philly and ended up at La Bella Moda, a boutique that carried Mikaella. Style 2100 was one of the last dresses I tried on that day and as soon as I put it on I knew the cut was exactly what I was looking for. The lace detail and flattering cut was perfect for the romantic look I wanted and the style was so comfortable to move around in. A few months later, I still couldn’t get the idea of sleeves out of my mind and called the boutique to see if we could put something together. We ordered extra lace from Mikaella that matched my dress exactly and designed a custom bolero jacket. I wanted to mirror the low back of Style 2100 with the jacket but wanted a higher neckline that rested right along my collar to wear for the ceremony. It came out perfectly. I was able to affordably create two different looks for my wedding day – classic bride for the ceremony and modern/carefree for the reception.